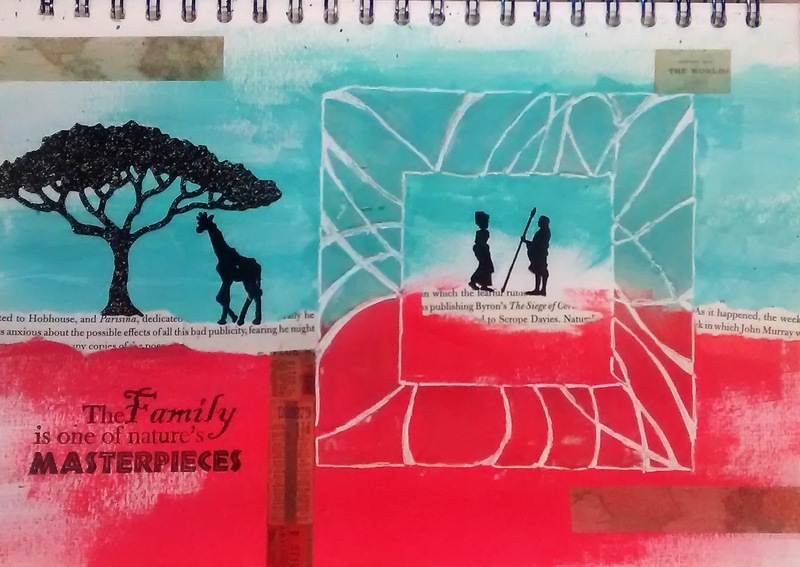 For the Mission Inspiration February 2017 challenge I chose the word Family from the five word prompts. The others were Crush, Relationships, Love and Affection. I don't have a printer at the moment, so couldn't print off any photos of my own family, but then I found a set of stamps which I felt would fit the colour scheme (black, teal and red) as well as the quote 'The Family is one of Nature's Masterpieces'. Unfortunately my camera battery failed and wouldn't recharge towards the end of the project, so the last few steps were photographed on my mobile phone. Apologies if the clarity isn't so good. Step 1: Add texture paste through a stencil. 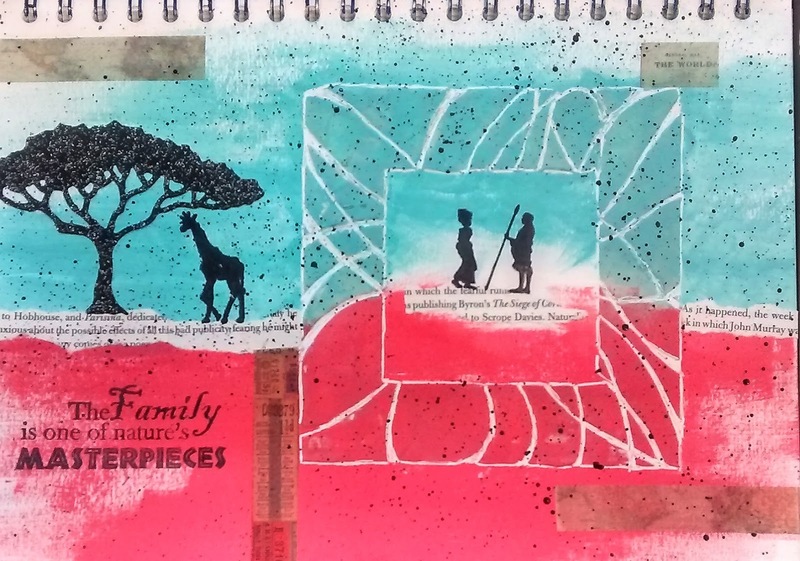 As the quote references a masterpiece, I chose one of the fabulous frame stencils by Claritystamp; in this case the Flare Frame and used Pebeo high density modelling paste through it. I overworked the paste a little in the top, but otherwise really liked the effect. Step 2:Add colour with paint or spray. For this step I used Abandoned Coral distress paint and Pool Satin Paint by Martha Stewart and dry brushed across the bottom and top of the page to create sky and earth, but leaving plenty of white space. Step 3: Glue fragments of book or music text. 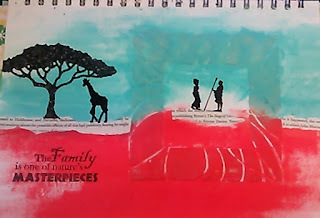 Out came the trusty Byron biography and strips were torn and added both to hide where the paint colours join and to create a horizon across the page. Step 4: Glue patterned paper shapes. I chose to add only one; using one of the Woodland Tree dies by XCut to die cut the most 'African' looking tree from black glitter card. 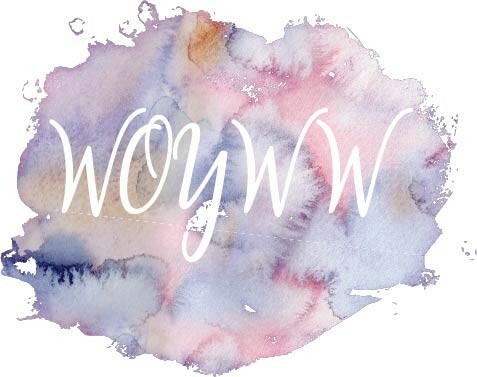 Step 5: Add hand journaling, scribbles or quote. I stamped the quote from the Words of Family and Strength stamp set designed by Sheena Douglass, using Black Archival ink and touched up one or two areas with a black micron pen. Step 6: Add a focal image or 2 or 3. 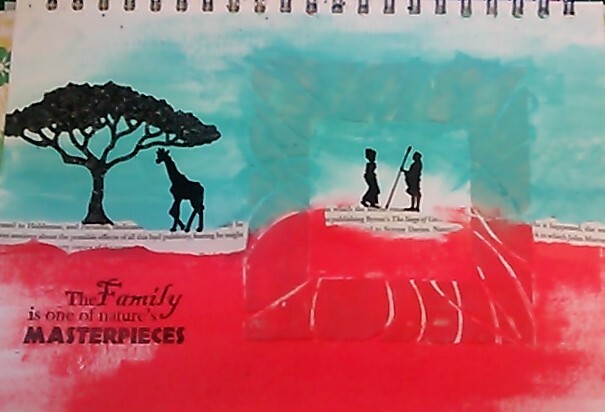 For this step I used the Wee Africa 1 stamp set by Claritystamp to add the silhouette images of a giraffe next to the tree and the Masai warrior and his wife in the centre of the frame. I made sure that they were all standing on the book text horizon to ground them. Step 7: Add washi tape or paper strips. 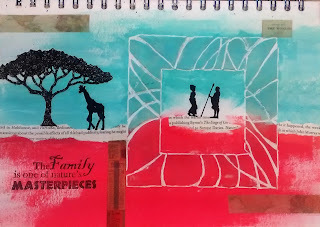 I chose two of the tapes in the Passport Tim Holtz idea-ology collection. I felt they matched the colours and also the idea of a world wide theme to the quote. At this stage I also used a white uniball pen to go around the edges of the frame in order to emphasize it. Step 8: Splatter with paint or gesso. For this final stage, I masked off the inside of the frame and used the Tim Holtz Splatter brush with watered down black paint to add splatters all over the rest of the page. This really tied everything together and this was the point when I finally liked the page.